The immersion into the sensual richness of the plastic of the body and its forms is the revelation of the first steps in art. The turning to modern art is search for archetypical formulae of life («Proposal». 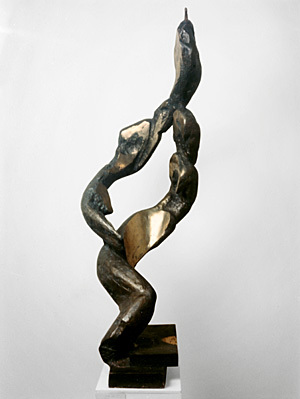 1964, «A Garnet Bracelet», 1965, «Soul and Body», 1974, «Organ», 1974, «An Artist» (self-portrait), 1976, «A Family», 1977, «Birth», 1978). The coming to find the specific features of one’s own intuition of rhythm and space in the series of compositions on the subject of labor, 1967 – 1987. 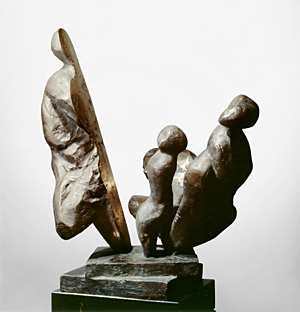 The discovery of the principle of the gradual transposition of parts of a figure in the wholesome space of the sculptural composition («Welders», 1973, «A Blacksmith», 1975, «Movement», 1977). The revelation of the composition in the Old Russian art. The attempt to reveal its principles in the three-dimensional space resulted in the discovery of the danger of disappearance of its sacral sense. The first realization of the need for canon – evolvement of the essence. (What does it mean – our aspiration for the purport? -- aspiration for God? -- for perfection and eternal life? Is it merely a lever of the natural selection? It is all these things combined). Experiencing spirituality at the level of the composition cosmos as purified rhythmically and musically. The symbol of the aesthetically valuable space represents a spiral in its impulsive rhythm (zigzag) expanding upwards as a crater. The aspiring movement upwards as value. But this is not the absolute value of the vertical and the horizontal of the Cross. The plastic of the sculptural body, directed upwards, and moving in its inclined motion which underscores the overcoming, is being screwed into the growing and expanding space of the imagined crater-cosmos. The symbol of the aspiration of temporal and transient for eternal and perfect. The details are subordinate to the motion of the principal plastic mass in the ascending anfractuosity of space – the main aesthetic value of the composition. This image, to what state of the soul does it mostly bear witness? – It is a soul that is not rooted in the Spirit, a restless soul (MOVEMENT), a soul which is prone to violence towards its own self and towards others (OVERCOMING), feeling a longing for elevated (ASCENDING), in the permanently nervous tension (ANFRACTUOSITY OF SPACE), but it is a soul that is also wholesome and harmonious in its own way (MAIN PLASTIC MASS – THE BODY OF THE SCULPTURE) («John the Baptist», 1977, «Steps», 1978, «Cathedral», 1978, «A Concert of S. Rikhter», 1979, «Therapontovo», 1979, «Opening», 1979, «Ascension», 1980, «Eternal Path», 1980, «In Memoriam of A. Rublev», 1982, «Transfiguration», 1983, «Cosmos», 1985, «Dream», 1986, «Wave-Running», 1994). There gradually grows the feeling of the need for the presence in the composition as a center of an individualistic beginning from which emanates the crater-space. This center may be located at any point of that space, but the center always creates the space and always dominates in it. For the individualistic beginning needs an ethical and aesthetic harmony before anything else, and it is that harmony’s sine qua non («Memory», 1988, «PIETA», 1990, «Eternal Path», 1995, the memorial plaques to V. A. Favorsky and poet thinker D. L. Andreyev, and the model monument to F. M. Dostoyevsky, 1997). This invoked in me special interest in portrait, which had previously also been a subject of my attention – as personification of the national idea ( A Portrait of B. Tunegov, 1962, A Portrait of Brother, 1963, A Portrait of M. Voskresenskiy, 1967, «Nikon Mikhailovich», 1975, A Portrait of Mother, 1978, A Portrait of A. V. Vedernikov, 1984, A Portrait of D. Ye. Galkovskiy, 1985, «A. S. Pushkin», 1986, «Lyuba», 1987, A Portrait of F. S. Kharitonov, 1987, “D. I. Mendeleyev», 1988, A Portrait of V. Kikin, 1988, A Portrait of V. V. Rozanov, 1990, «Poet S. A. Klychkov», 1993). Overwhelming in the portrait is the ontological front view. The portrait of Rozanov is the only one that is «non-canonical», it is a three-forths view. (But so also is «The Savior» by Andrey Rublev). The lofty content of the icon-image is becoming ever more clearly enunciated. The spiritual distance between the front and the realistic portrait is the distance between the way of life of an icon-painting monk and that of a secular painter. The mental realization of that distance has supplied me with an understanding of the limits of my own creative work. It helped me to concentrate quietly upon individual’s accessible levels in art – the realistic portrait, the nature study, the drawing. That coincided with the restitution of value to facts of ordinary life. The restitution did not involve, however, any abdication from the former acquisitions and took place in the hope of synthesis. (A series of nature studies, drawings, and portraits in 1985 – 1995, and later). The model monument to V. S. Solovyov presupposes a symbolization of spiritual vision, which vision fills the personality of the thinker as well as the social idea that is connected with him and with his creative work. The divine light that has found reflection in the doctrines of V. S. Solovyov, and which has put a certain imprint upon his image, is symbolized in the portrait picture which is a kind of a part of the cross and stays in compositional connection with the architectural space of the monument that is opened outwards. The plasticity (=«the transiency, transitory character») is limited with the ontological vertical of the cross. But what about the place, after all? (Rhetoric is an instrument of learning about oneself). Well, works of visual art have to be seen.